TurboXE 500 fan units can handle a variety of indoor/outdoor humidification or evaporative cooling applications. The nozzle-free fans can atomize ordinary water supplies into a very fine mist-like fog. Utilizing high-speed centrifugal force and powerful air flow, these units can propel a misty-fog stream up to 25 feet away. Widely used in mid-small scale commercial applications to humidify or evaporative cool air spaces. 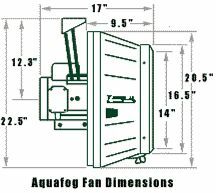 One of the smaller TurboXE fogging fans; the XE-500 Greenhouse Fogger is designed for small spaces between 25 to 45 feet in length that need the fogging capability and industrial quality of the Aquafog line. This model has a maximum fogging output of 12 GPH and can propel fog up to 25 feet. Unlike the larger four-blade units, the XE-500 utilizes a two-blade fan, making it about 30% quieter than the XE-2000. ****XE-500 comes with a 1/2HP motor and a 1/4HP fan blade assembly. ****XE-500 Fans are standard equipped with a dark green housing and a dual voltage, white epoxy painted wash-down-duty™ (WDD) motor 115/230V, 1ph, 60Hz. Humidistat ControExcellent for controlling long operation cycles, Often the choice for applications when humidity is desired above 80%. Using extended cycle operation, the operator can attempt to control humidity levels utilizing manual control of the flowmeter panel.Time cycles as short as 1 hour. Two sets of on/off trippers provided.